Welcome to the world’s first Medical Intuitive Card Course, by Internationally recognised and award winning Medical Intuitive and author, Jean Sheehan. Each Medical Intuitive card has been specifically designed and created for metaphysical healing and insights to what your body is saying. 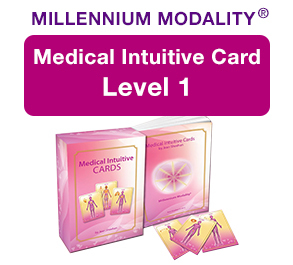 The accuracy of these cards has been accepted and used by natural health professionals and medical doctors. Every pack of cards has a pocket book that gives you truthful messages. They are used for readings, sessions, or your own daily guidance and inspiration. Time to heal yourself to have the life you were born to have. Nothing like this in the world. Be the first to join Jean Sheehan as shares her magic and wisdom through her global vision of healing the world with her Medical Intuitive Card Course. Jean has successfully accredited her Millennium Modality® courses which are accepted in 26 countries globally. Her College, Millennium Education, is a recognised training provider. This is a certified course and is for those that are truly wanting to help themselves, and others and heal on an extraordinary level.